IMHO the early to mid 1970's run of Amazing Spider Man is the best of the medium.This was really good. Seriously. EVERYONE blames Spider-Man for everything. Gwen died, its his fault. Her dad died, it's his fault. He's fighting robbers, he's robbing them. Literally every other appearance Punisher or Human Torch are either fighting him or helping him. Now Nova? A super-powered galactic warrior is yelling at Spider-Man for killing his uncle. I don't like Peter and MJ always hating each other for no reason, but this is just obnoxious. Aunt May continued to be insufferable in this volume when she became an annoying activist for rent control. Arguably this volume has the most action with lots of interveaving arcs, Liz's return marks a new beginning for Harry Osburn, Mary Jane Watson becomes the love interest after the death of Gwendoline, Flash became mature and got along with Peter. J. J. Jameson was still insufferable too, Betty Brant and Ned Leeds are having problems. Peter graduated from Empire State University, there is new hope for our beloved superhero. This tells the stories of more of Spider-man's amazing adventures. I think this was kind of boring because it was really old and I liked the movies more. After Stan Lee and Gerry Conway's superb runs on the Amazing Spider-man, it's safe to say that Len Wein's 30 issue run on the title was middling by comparisog n.This book collects, the final 2/3 of that run from Amazing Spider-man 160-180 along with Issues 181-185, Amazing Spider-man Annual #11 and Nova #12.The book retreads a lot of old territory with reviving villains such as the Molten Man The Lizard, the Kingpin returning with stories very similar to what's gone before. The same can be said guest appearances by the Punisher. We have the return of the Green Goblin (#176-180) with a story that will give long-time readers deja vu as it is reminiscent of so many other Spider-man stories (though there is a twist but the book makes it too obvious.) We also have a new spider-slayer. The Rocket Racer is Wein's chief contribution to Spidey's rogue's gallery and he isn't that great of character. There were a few interesting twists in Wein's work including J Jonah Jameson almost discovering Spider-man's secret identity. Still, at this point, Bill Manlo was doing far more interesting stuff on third Spider-man series, Peter Parker the Spectacular Spider-man and one of the more interesting stories borrowed the hitman from that book so they could have a battle royale with the Punisher and Jonah atop the Statue of Liberty. There are also a two part team-up between Spidey and Nova which stangely enough is a whodunit.Despite its lack of originality, I enjoyed Wein's work. Wein gets all the characters right. This is crucial because in the 1970s there were so many changes to comics (many of which were misguided) that actually knowing your character and having them right was a tough challenge, though at times they did get a little melodramatic. (See Liz in Spider-man #180) Plus Ross Andru's art is really well-done and it's on nearly every page (except for Nova #12, the Annual, and #181.) To non-Wein material, the Annual was scripted by Bill Manlo from a plot by Archie Goodwin and it's about Spidey taking on a movie role where there's mayhem on the set. It's, of course, not Spidey's first foray into movies even in an Annual (Amazing Spider-man Annual #4), but this one shows some lessons have been learned. For example, Spidey demands cash because he's had difficulty cashing checks made payable to the order of Spider-man. It's a fun story.Amazing Spider-man #181 was written by Manlo with art by Sal Buscema and it's called (for obvious reasons, 'Flashback') and it's an extended story in which Spidey has a flashback over his whole career, shedding no new light on anything. It's a bit lazy way to come over the transition to the new writer.Marv Wolfman takes over at Amazing Spider-man #182 and #183 and we're given an origin for the Rocket Racer and introduced to the Big Wheel. It's an okay story though I'm not certain I buy the Rocket Racer as some sort of blackmailer. Spider-man #184 and #185 features a good story of Spider-man battling the White Dragon which feeds into the Martial movie trend of the era. 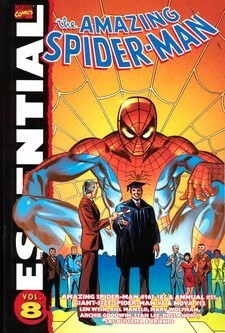 We also get to see Peter graduating (sort of) in Amazing Spider-man #185. Wolfman tries to revive the idea of the "Parker luck," leading to a somewhat downbeat end, but it had nothing to do with luck and everything to do with Peter not keeping track of his stuff. Overall, a mixed bag but still good enough reading because it may not all be original but its Spider-man. Len Wein was, I thought, a fairly terrible Spider-Man writer. His take on the relationships was overly melodramatic, his villains (both chosen and created) some of the cheesiest in Spidey's rogues gallery, and his whole run felt more like '60s DC than '70s Marvel.That said, the Punisher story in this one, despite featuring a Wein-style groaner of a bad guy named "The Hitman," is the highpoint of his run. But I was looking forward to seeing Marv Wolfman (also very hit and miss for me in general) just for the change of pace.And Wolfman's first story features the return of Wein's Rocket Racer and the first (and for a long time, last) appearance of Big Wheel. Followed by a really weird take on Betty Brant-Leeds, who abandons her happy ending to become the struggling mess that she's been ever since. As with the previous volume, there's some great artwork by Ross Andru, and I know that after just one more Essential, we'll be getting into the Roger Stern stuff that was my introduction to the character, but with a few exceptions, this Spider-Man volume (and the one before it) are more or less for completists only. Some fun stories. One of the highlights is a multi-part Green Goblin story where there is a big mystery as to who the Goblin is. The original (Norman Osborn) is considered dead at this point, and his son, and Peter's friend, Harry Osborn, became the Green Goblin after his father died, but had since given up being the Green Goblin, so the mystery is fun, and there is a nice twist at the end. There are also some great moments with J. Jonah Jameson, being shown at his best and worst. A couple of things I didn't like about this group of issues is that one issue is a recap of earlier Spider-Man stories, including his origin. I guess it was meant to bring new readers up to speed on Spider-Man's background. The other involves a long running subplot where Peter is doing poorly at college because he is spending too much time being Spider-Man instead of studying. I guess they had no idea how to resolve this story, so it is more or less swept under the rug. Nevertheless, it is an entertaining collection and well worth the price if you are interested in Spider-Man. Spider-Man is my favorite superhero, hands down. This compilation does not disappoint. Always balancing his friends and love ones with odd ball supervillains showing up at odd intervals, it's what the Silver Age comics are all about.There's a decent amount of "Peter Parker life twists" in here that are exciting: Aunt May's health, proposing to Mary Jane, trying to graduate from college, etc.Plus some cool superhero storylines (Green Goblin returns yet again, the Rocket Racer is amazing). In particular, the crossover with Nova, a fairly shortlived powerbeam shooting teenager, was pretty entertaining and different.If you like Marvel Comics, get this. Growing up, I loved "The Amazing Spider-Man" comic books. And this collection comes from the era when I started reading all about Spider-Man and got my hands on any issues my parents or grandparents would buy for me.Yes, I had a lot of gaps in the collection, but I still have fond memories of enjoying the stories.I probably should have left them as fond memories because, quite frankly, the stories in here haven't aged well. Outside of one arc with a third incarnation of the Green Goblin, most of Spidey's battles are largely forgettable. Peter Parker does graduate college but even that's not really enough to sustain things for the entire run collected in this volume. Another very strong volume. Might be one of my favorite ones overall. Peter graduates, we meet the rocket racer, harry defeats the new green goblin, Mary Jane moves past Peter and Spider-Man more or less goes through the same kinda crazy stuff. Really good and very strong volume. Especially loved the bizarre Annual #11. I'm a sucker for Punisher and Lizard stories too. And we see a Wein-written Nightcrawler, which is shocking! Super good, i love this series and am very glad that i've read almost 200 issues of it. A good solid read, but nothing spectacular. This volume includes the end of the original abominable Clone Saga, and the third coming of the Green Goblin. The highlight is that nearly every issue features artwork by Ross Andru, ably inked by Mike Esposito, Tony DeZuniga and Jim Mooney (among others). So far, volume 8 lacks the crazy awesome drama of 7, if only because Peter Parker's life must necessarily become peaceful for a bit with the ebb of the Clone saga. Howevs, I'm sure the next major arc will occur soon-I'm only halfway through! I think I read these stories for Peter Parker more than for Spider-Man. It's fun to see what's progressing in Peter's life and how he and his friends are aging. Nothing in this set stood out, except for the Nova/Spider-Man crossover. It's f-ing Spider-Man, do you really need a review? Len Wein Marv Wolfman Bill Mantlo Archie Goodwin Stan Lee Ross Andru Mike Esposito Jim Mooney - Len Wein was an American comic book writer and editor best known for co-creating DC Comics' Swamp Thing and Marvel Comics' Wolverine, and for helping revive the Marvel superhero team the X-Men (including the co-creation of Nightcrawler, Storm, and Colossus). Additionally, he was the editor for writer Alan Moore and illustrator Dave Gibbons' influential DC miniseries Watchmen.Wein was inducted into the Will Eisner Comic Book Hall of Fame in 2008.